We went to see Paddington on Friday, and after the movie ended, Eli 13.6 and I needed to go to the bathroom. There were two urinals: one tall, one short. I walked in first and immediately took the tall one. "In bathrooms, there are no families," I said, "only strategies." "You are the worst," he said, standing at the short urinal. "Basic urinal strategy," I said. "Game of Urinals." "Now that could be an HBO series,"Eli said, laughing. "Episode One: Out For Yourself." As for the movie, it was entertaining. It was an extremely liberal interpretation of the Paddington canon, but they did do a good job of capturing the warmth of the Brown family and Paddington's irrepressible spirit. I have very, very fond memories of Paddington. The books were charming and innocent, places where nothing really bad ever happened, and they were full of a gentle humor that barely even exists anymore. 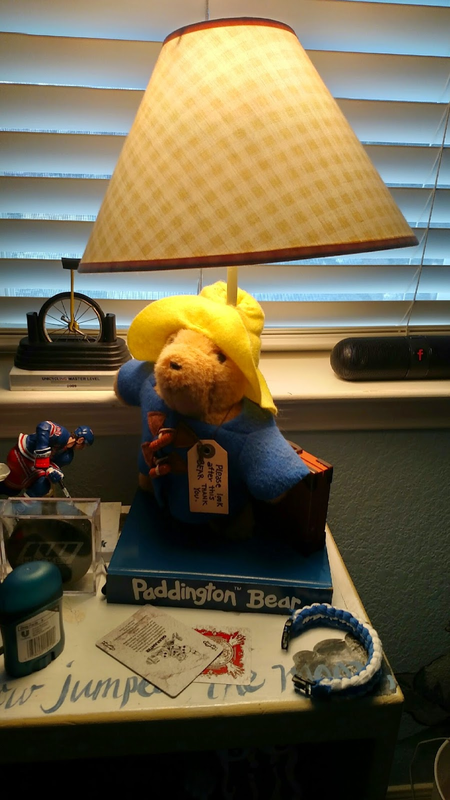 That Paddington lamp is 30+ years old, and it's mine, handed down to him. And I hope he hands it down to his children, someday.